Submitted by akreider on Tue, 03/19/2013 - 00:15. The new valuations for commercial properties will generally cause their taxes to decrease. 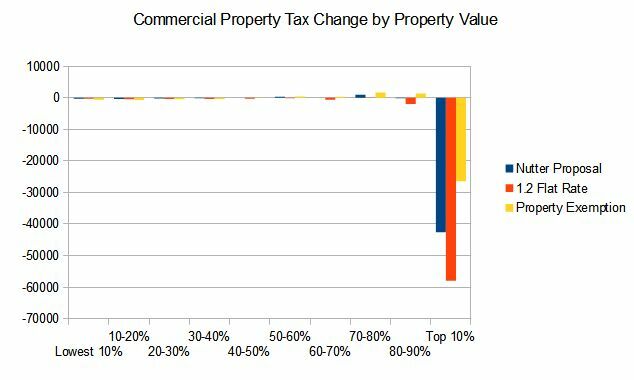 This analysis is only looking at the regular property tax rate paid by commercial property. I am not looking at the Use and Occupancy tax as Nutter has not made a proposal on this that I know of. If the Use and Occupancy tax is not decreased it will lead to a dramatic increase in tax on commercial property as the U&O tax is set at 5.51% (four times the proposed 1.32% rate). My guess is that the U&O tax will be decreased to make it roughly revenue neutral - perhaps between 0.5% and 1%. My suggestion for the U&O tax is to have a property exemption and set it a rate that will be adequate to maintain or increase the taxes of the largest 5% of commercial properties who face a MASSIVE tax break from AVI. I'm not sure if this rate will be revenue neutral as I haven't run the analysis yet. 1) Mayor Nutter - 1.32% rate with a $15,000 homeowner exemption. 3) Me: 1.45% rate with a $30,000 property exemption that applies to both residential and commercial property. It is easy to see that all three proposals have a massive tax break for large commercial properties. The Property Exemption rate reduces this tax break significantly. It is hard to see anything else from the graph as the numbers for the large properties dwarf everything else! Here you can see that the Property Exemption proposal would reduce the taxes more than Nutter's proposal for properties up to $320,000. And it would reduce the taxes more than the 1.2% flat rate for properties up to $167,400. I've added the top 5% and top 1% of commercial properties as they stand to benefit the most. 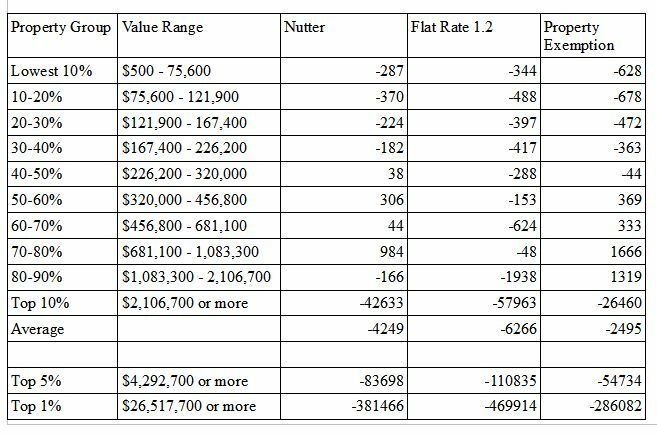 I've included the average values because I used them in my residential analysis. However, they aren't that useful as the large properties outweigh everything else.